Sega has posted a new promotional trailer for their Transformers: Shadows Rising arcade game. TRANSFORMERS Shadows Rising is the long-awaited follow up to the smash hit licensed video game TRANSFORMERS Human Alliance. In TRANSFORMERS Shadows Rising, players are partnered with three movie’s stars, Optimus Prime, Bumblebee and Sideswipe to stop evil Megatron’s plans. Players must battle their way across America, Europe, Asia and the earths solar system in this action packed game. 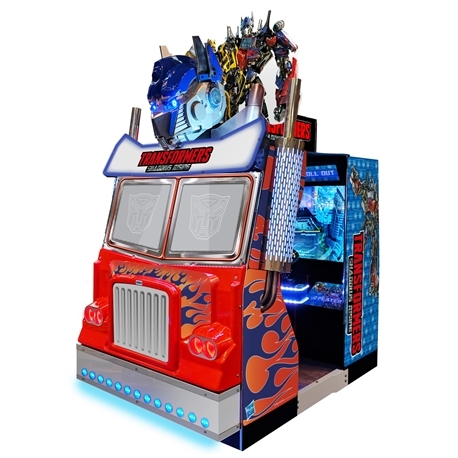 The game is presented in a sensational cabinet, based on the truck vehicle mode of the leader of the Autobots, Optimus Prime. 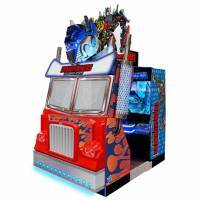 With gorgeous chrome exhausts, big grill and lifelike Optimus Prime head this cabinet is designed to stand out in any location. The brand new ‘Hyperenergy Tech’ lever can unleash a devastating shockwave to destroy multiple enemies, or be used to generate a forcefield defending the player from difficult enemy attacks. I played through Human Alliance with my brother last night, what a fun game. Can’t wait for Shadows Rising. It would be cool if you could play as Titan masters instead of humans though! Me and my brother loved Human Alliance, so I'd deff give this a shot if I ever saw it. Definitely want to give this a go, if I ever see it. All good things to those that wait. One of the malls in Haggertown MD is getting a new arcade and I'm pretty sure I saw this amongst the setting up chaos.